CotEditor is a light-weight, neat, yet powerful text editor designed for editing plain-text files such as web pages (HTML, CSS), program source codes (Python, Ruby, Perl, etc. ), structured texts (Markdown, Textile, TeX, etc. ), or any other kind of plain-text. The application is exactly made for macOS. 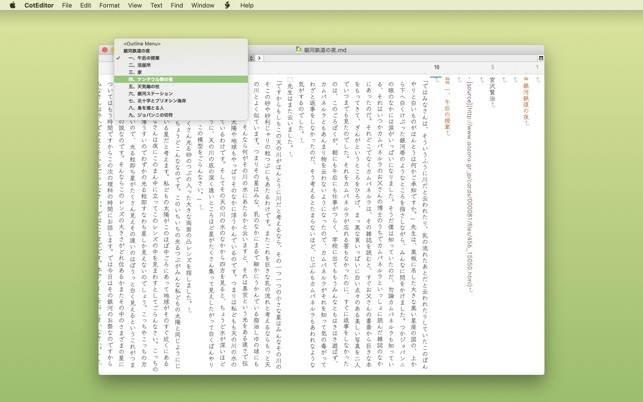 CotEditor looks and behaves just as macOS applications should. It means, you already know how to use it even on the first launch. There are no complex configuration files that require geek knowledge so that you can access all your settings including syntax definitions and themes from a standard preferences window. CotEditor launches so quick that you can write your text immediately when you want to. 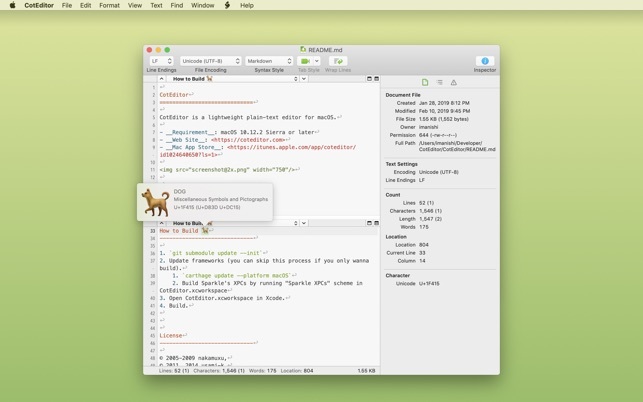 It's perfect for you to write a draft version of your document or a scratch code. The simply organized user interface doesn't disturb your task. 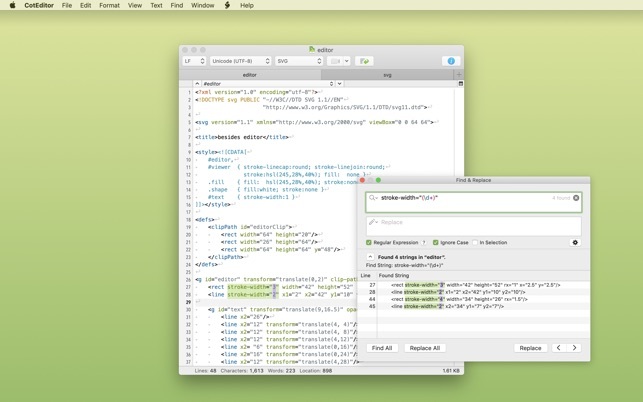 However, at the same time, CotEditor is neither a software only for beginners nor a typical minimal “zen-style” editor. It is fully customizable. There are, of course, syntax highlighting feature for various languages, find and replace with the regular expression, auto-indentation, command-line tool, and lots of other deep functions. You can also easily write your own macro in your favorite languages. 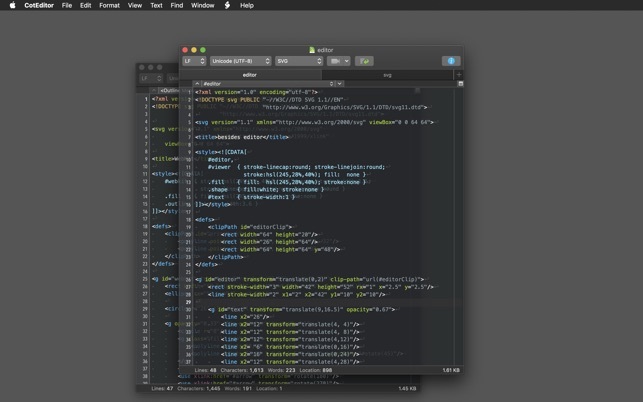 - Make the i-beam cursor more legible in vertical text orientation and dark background theme. - Use monospace numbers for line numbers in Find All result table. - Optimize performance highlighting found matches. - Fix an issue under macOS 10.12 where application hung up if some specific toolbar items are visible. - Fix an issue where the “Discard Changes” and “Cancel” buttons in the dialog for encoding reinterpretation performed oppositely. 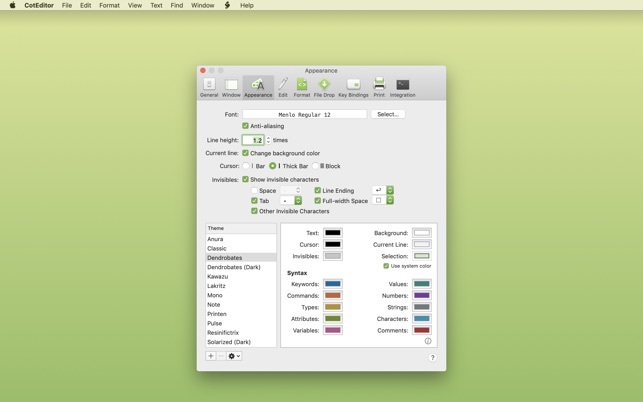 - Fix an issue where color code editor was invisible under macOS 10.12. - Fix an issue where the Go to Line command did not jump to the input number of line when performed by clicking “Go” button. - Fix an issue where `change kana` scripting command did not work. (1) I think the "Enable Auto Save with Versions” feature is a bit dangerous. I did a Find to search for text, but instead of hitting “Find All”, I hit “Replace All” by mistake. I could not figure out how to undo my change, so I closed the main window thinking that I had not saved my file. But the file was auto-saved with the unintentional change. I now know that I could have closed the Find window, at which point “Undo Replace All” would have appeared as an option under the Edit menu. However, I think that “Enable Auto Save with Versions” is not a good feature for novices. The default setting should be false. (2) I would really like to see a “Whole Word” checkbox in Find window. Thank you for the kind review. In response to your second request, I've added "Match only whole Word" option to find panel (in "Advanced find options" via the gear button in the find panel) on CotEditor 3.6.1. Regarding the first comment, we will not change the default setting of Auto Save because it is nowadays the standard behavior of macOS applications. Please just turn it off if you want to avoid. This app is perfect for when you need something more fully-featured than TextEdit, but don't need a complicated project manager like Atom or similar. The major selling points for me are Unicode support (the ‘Inspect Character’ and ‘Input in Unicode Hex’ commands are extremely helpful, and greatly reduce the need for character escapes in your documents) and the fact that it plays well with proportional fonts (many text editors have bugs when you use a font that isn't monospace—not so with CotEditor!). If I had to list drawbacks, the syntax highlighting is not as fully-featured as you might find in something like Atom. But I've been using CotEditor for several months and never found it missing a feature that I needed for my work, and it is refreshing the extent to which things that one might need to download a plugin for in Atom or Brackets just come built right in. I thought I'd try app this out, as I've been looking for a simple text editor that supported markdown. And I was blown away by the robust features that came with this 'simple' text editor. I use like the app 'Drafts' as a starting point for all things text, and then I export (share) them to my other apps. This allows me to work with text in many ways without bogging down my computer with all the memory overhead of the other editors. To the developer: You should really be charging something for this to allow you to keep developing it, it's that goodd.